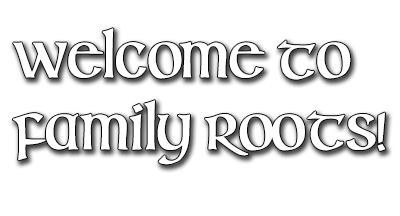 At Family Roots, we help families celebrate their history by crafting heraldic items such as family histories, embroidered coats of arms, heraldic shields, European designed swords, family crest rings and medieval armor. We were founded in 1990 and we currently employ a "family" of over 40 staff across our headquarters in Louisville Kentucky, and our overseas office in Dublin Ireland. We've been working successfully with U.S. military personnel and their families for over 25 years in Germany, Italy, Bosnia, Kosova, Kuwait, Japan, Korea, Hawaii, Iraq and Afghanistan as well as the U.S. And we take great pride in that. 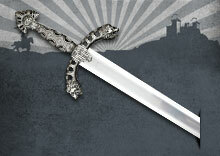 Our selection of heraldic swords, comprises of the highest quality made swords in many European styles that will enhance any family research package. 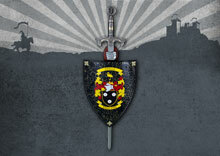 The shield depicts the family coat of arms in full color. On the shield reverse is your family name history, which includes the country of origin for your family name, the meaning of your name, and many fascinating historical records. Swords and shields can be combined in sets. 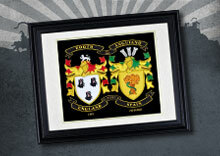 These can include a shield bearing your family coat of arms, and a history of your family name on the reverse. 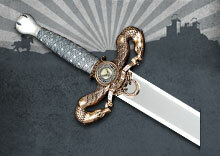 As we receive the research details of your family name we will complete your set with a sword that's connected to your heritage. 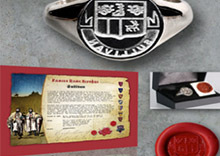 Our heraldic range include many other products from the medieval past, such as axes and heraldic jewellery. Our embroidery collections feature authentic handmade family histories and coats of arms. They are a spectacular way to illustrate your family's unbroken connections back through history. Custom made Military Achievements' embroideries are crafted for all branches of service. Our unique range of bespoke products celebrates the career milestones of those who sacrifice and serve in the protection of our great country. Check out out F.A.Q Page! 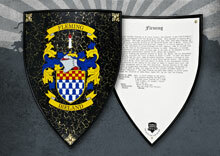 We are excited to offer the option of having a custom shield or embroidery crafted in your very own design. Display Your Shield, Protect Your Heritage.